I am enjoying making and eating all sorts of different dishes while on Whole30. I went into this with the attitude that I am willing to try and make effort to try new food, or it can get boring really fast. I don’t remember the last time I bought purple cabbage, maybe years? 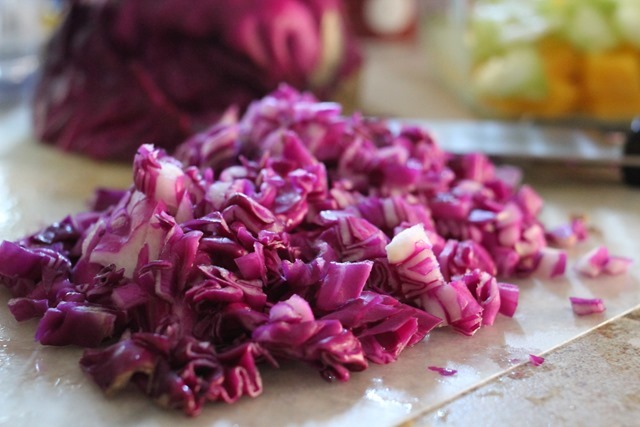 This week, I bought a huge red cabbage and have used it in a few dishes. I used to cook with radicchio but I also haven’t eaten that for awhile. 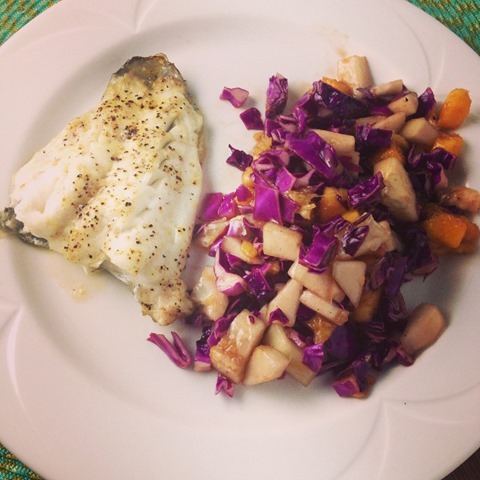 I was inspired to make this recipe while perusing Everyday Paleo cookbook. It looked really easy and simple, and the author mentioned in the book that her kids loves it and ask for it often. The first time I made it, I didn’t have shallot so I just excluded it. Even without that ingredient, I was happy with the slaw and have made it the same way ever since. 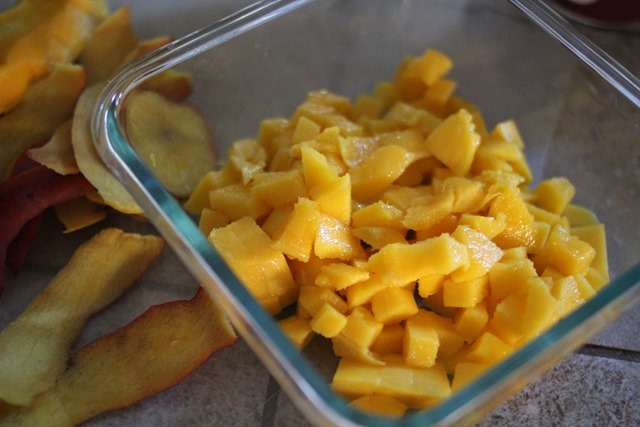 I also use a whole mango and double the recipe every time I make it. I have included this twice now during my Sunday prep. I chop all the ingredients and store it in a glass container. I eat it throughout the week and put the dressing right before serving. 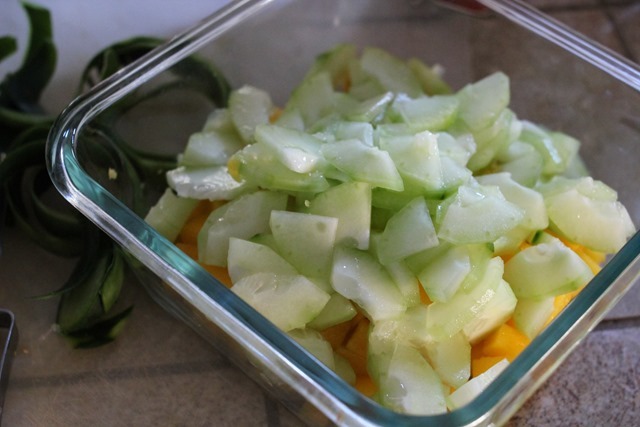 I love the crunch in this slaw and our little man loves it too, he will eat the mango and cucumber portion. – Optional: 1 shallot, minced (I’ve excluded this every time). I’ve also added chopped fuji apple to change things up. Combine all ingredients in a bowl, mix and serve. Recipe adapted from Everyday Paleo cookbook. 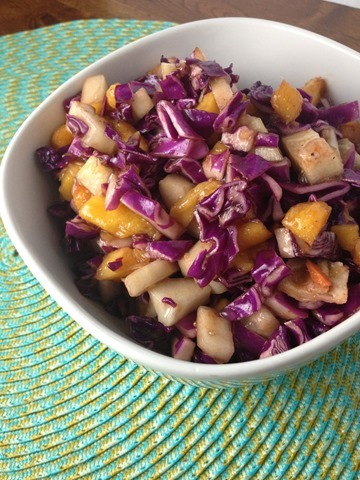 I love the idea of mango with the purple cabbage! Looks like a beautiful salad (one that I could eat on its own as a meal). I’ve been wanting to make a slaw for a while now. I had one today that had beets & purple cabbage. I like that yours has mango!